This game was understandably delayed after the atrocious acts in the news recently and rightfully so. It was respectful of the publishers to hold off on the release rather than storm ahead on the proposed date. 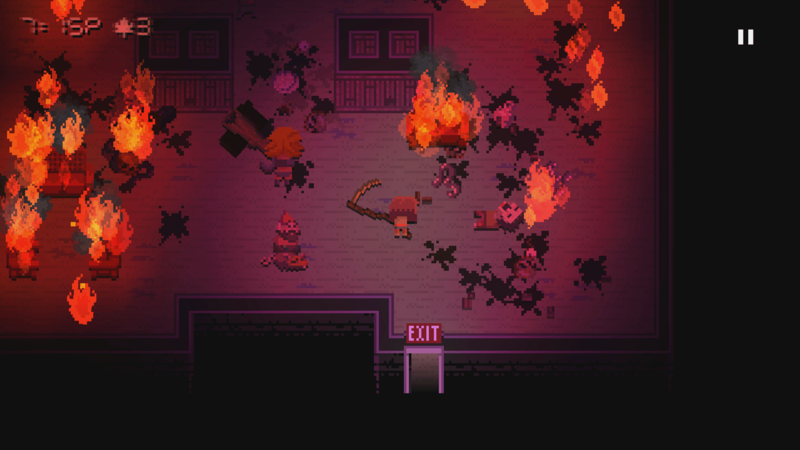 It shows that video games can be and are sensitive to real world issues – a large part of Death Road to Canada shows cars plowing into shuffling corpses. A part of me wondered if maybe this would hurt the excitement for the pixelated zombie adventure, but of course, it has already seen the light of day on PC and other platforms. There is no doubting however, that certain aspects of the game took on a very different tone and while this is a game set in an apocalyptic future where mankind is being slowly eaten by the undead, the visceral visuals are a little more gruesome, now. 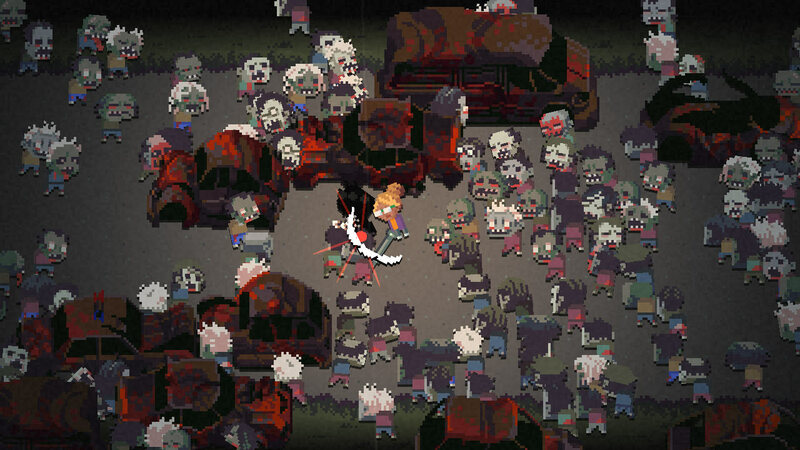 Using a pixel art style doesn’t take away the pools of blood, squishy brains and cranium exploding violence. If anything it magnifies it through the use of bold colours and easy on the eye aspects, but this isn’t glorifying the action, because the comedy softens it hugely. Picking up discarded femurs and brandishing them as weapons can only bring about a smile, rather than a grimace of shock. The fighting only represents fifty percent of the game, though. Controlling your tiny avatar as they explore detritus and containers for food, weapons and fuel is fun, but ultimately repetitive. The swarms of zombies generally stalk you and your party through wastelands and buildings in varying degrees of nuisance. Sometimes they will form up in a huge swarm of teeth gnashing hunger, other times they will shamble around without a care for human flesh. The game informs you of which of these you’ll face before heading into the fray and you can tool yourself up in the best way to deal with the crowds. A handy team screen displays the personal inventory of your squad before each ‘mission’ and their personal perks – which are upgradable or discovered through play – can boost their skills with firearms or melee weapons. Your team will top out at four members, which creates a stronger force for dealing with the walking dead, but comes at a price; more food will need to be scrounged up and morale will be harder to control. Because the other fifty percent of the game plays like a choose your own adventure mixed with an option based role playing game. In between gory fights your team is travelling to Canada which is supposedly free from infection. Scenes play out in the car which alter how the team will work together. This is controlled through choosing options to prompts; for example one character might have awful mechanic skills, when they attempt to repair the car they will fail and their morale will fall. This can also happen if somebody tries to heal another member of the squad. It’s an interesting dynamic because all stats are hidden until you try something out. Meeting new people on the road is always a gamble and they can be recruited to the team, but might be sly and ready to steal your food or they could be a great benefit in fights or other situations, like keeping watch while others sleep or being diplomatic in tense situations. The latter can arise in many forms; bandits controlling bridges, hostile survivors or even squabbles among the team. Most of the time you’ll choose an option and either reap the rewards or, at worse, lose a team member. Death Road to Canada is a complete gamble and while you’ll learn a few options are always safe, new experiences are constant. There’s plenty of tension, especially when your team is close to the destination and are slowly becoming stronger, but you could stumble upon a huge group of fierce zombies and lose members in the blink of an eye. To balance this tension, there’s plenty of humour in the narrative. 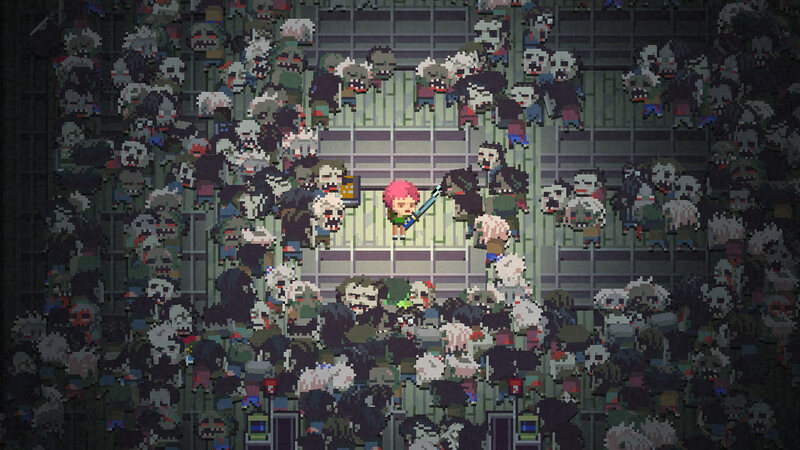 Death Road to Canada is more Shaun of the Dead, than Dawn of the Dead. 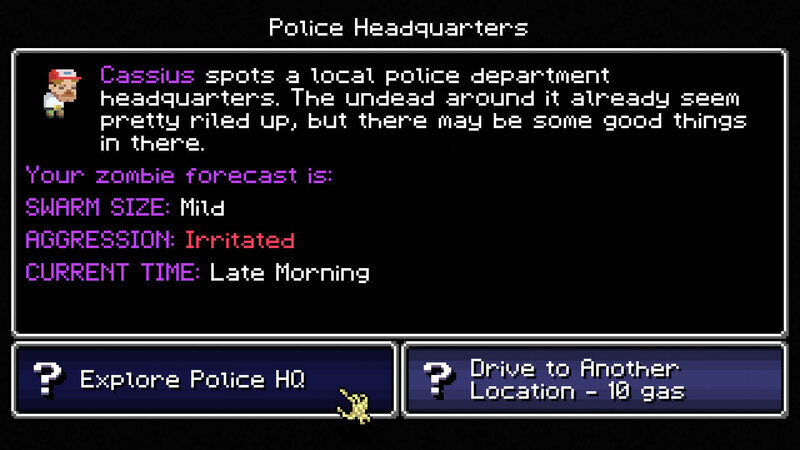 Characters from other indie games will appear on the side of the road, or you might pick up an Elvis impersonator. Packs of dogs can be recruited and will even drive the car, although quite badly – they run through more fuel, for instance. Someone might fart in the car and you’ll need to choose who to blame it on, which could boost or degrade morale depending on the person’s outlook on life at that moment. There’s definitely a tongue inserted in the cheek here and if there wasn’t any wit or sarcasm, the game just wouldn’t work. While there are plenty of modes to try out; the ability to create characters based on your friends and family or favourite celebrities and you can fight extra challenge in tougher game styles; the game does feel repetitive a lot of the time. Cameos are fun, but the game often plays out in the same way and you’re left reading the same old text boxes and fighting through random, but similar building layouts. You can collect zombie points in the levels or for rescuing certain people, even holding off a siege of undead, these points are used to open new character classes which do change small aspects of the game, but you really need to fall in love with the concept. Playing this on the Nintendo Switch does give the game legs, due to the pick up and play aspect of the system. Grabbing ten minutes here or an hour there and Death Road to Canada loses the possibility of stagnancy, but it’s not an ideal game for long sessions. It looks great, sounds decent and the ideas are genuinely interesting, especially if you add in your friendship group with traits and skills similar to real life, because it adds a whole new spin on the game; you might even care for the team a little more if you want your friends to survive. It’s nice to see a resource management game mixed with action appear on the Switch and though there are a few flaws here and there, there’s no doubting it’s the best game of this type on the system currently. Review based on code supplied by PR. Head here for more on our scoring policy. Far Cry 5 – Complete!